Girard-Perregaux is a big enthusiast of the motion picture arts and is already a partner in the prestigious Festival Lumière – they recently honored iconic Filmmaker Quentin Tarantino as recipient of the 5th Lumière Award. 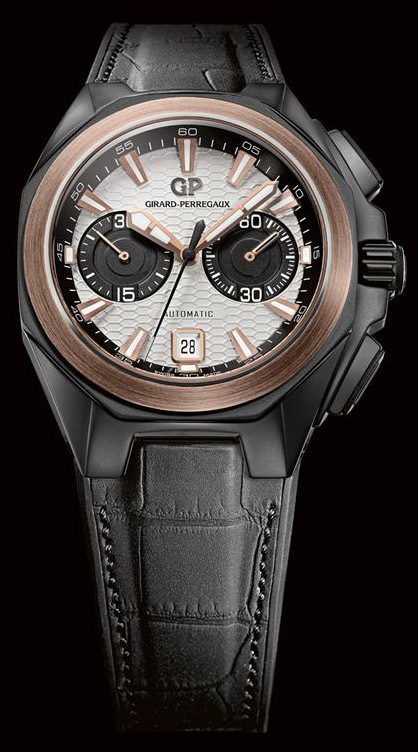 Hugh Jackman is also an ambassador for Girard Perregaux watches and last year they announced they would be the Exclusive Timekeeper and a Founding Supporter of the Academy Museum of Motion Pictures. This latest model for the new Chrono Hawk line is called the Hollywoodland and develops further the brand’s focus on the world of movies and is an unofficial homage to the movie making capital of the world. 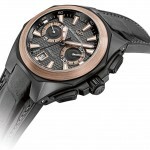 The Hawk collection consists of the Sea Hawk diver watches and the Chrono Hawk chronograph models. The Hollywoodland model will be in two versions, with one having a darker gray dial and the other a lighter dial. They are being added to the other three currently available Chrono Hawk models and will be available as part of the main collection from now on. 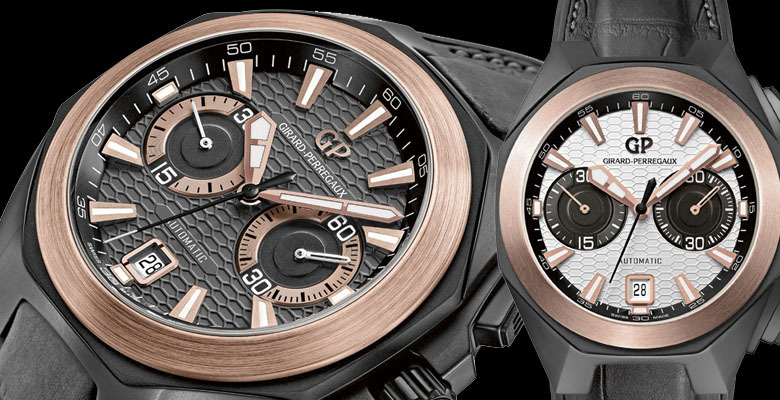 Girard-Perregaux has recently started to focus more on sports watches with the Hawk lines of watches with the Chrono Hawk and Sea Hawk being Girard-Perregaux’s new sporting lines. 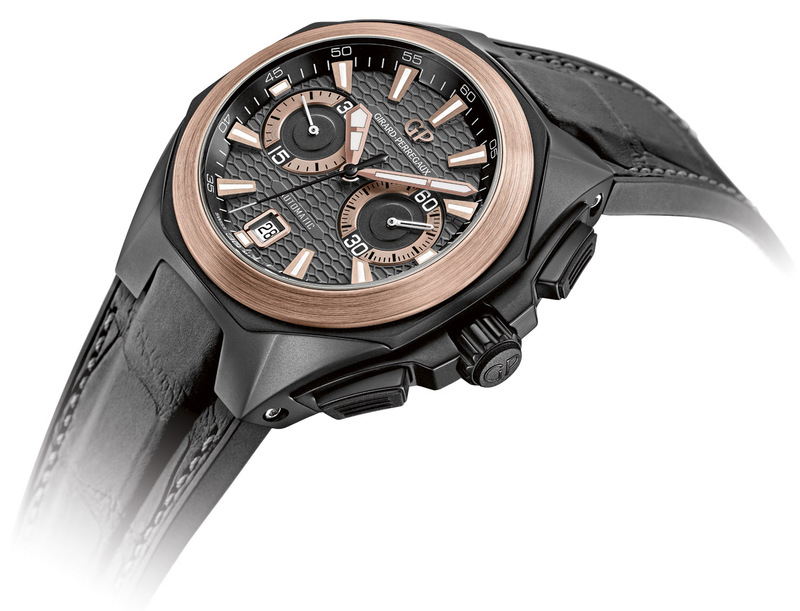 There is currently one black ceramic model in the Chrono Hawk line, with quite a military feel featuring a matching black dial and black rubber strap however with this model the case materials are perhaps the most unique aspect about the Girard-Perregaux Chrono Hawk Hollywoodland watch. With a substantial 44 mm in diameter the case is produced in all black ceramic, while the bezel and dial accents are in 18k rose gold with alternating matte and gloss finishes that emphasize its familiar angles and curves. The combination of black and gold compliment each other well and the bezel has a notably fine-looking circular brushing that prevents the piece looking too flashy and makes it more discreet. Rubber is also used throughout for both practical and visual purposes , it caps the curved chronograph pushers making them easier to push and there is a black rubber ring between the case and bezel. With its ample size and long lugs it will suit people with fairly large wrists. The case is water-resistant to 100 meters and the black strap like the case is also a combination of materials, made from black aligator leather but with a coating of technological rubber at its base, it comes with a folding buckle in titanium PVD with a ceramic cover. 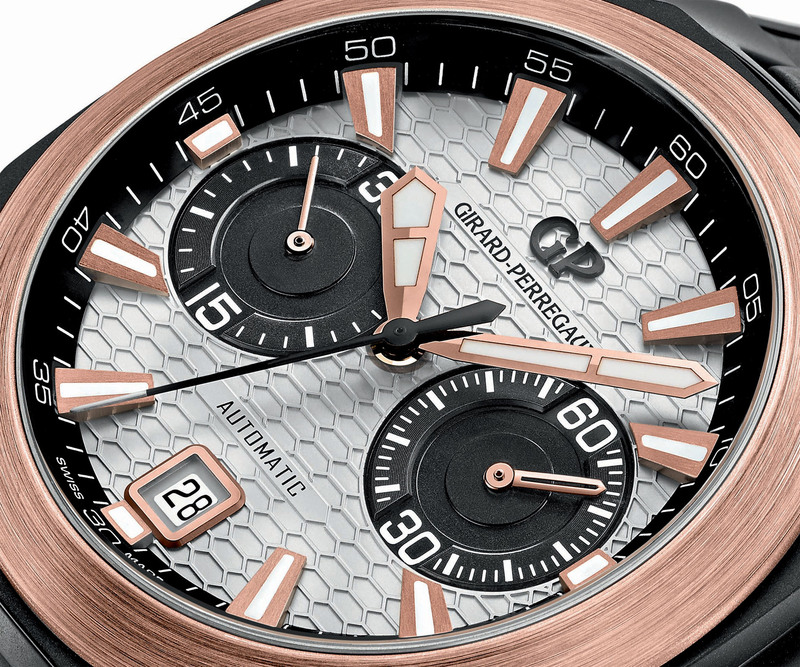 The dial is similar to that of the Sea Hawk in that it has a squashed honeycomb texture which further adds a modern feel to the piece and is part of the intent by Girard-Perregaux to add depth to the dial. Apparently this relief pattern on the dial is intended to recall the shape of Girard-Perregaux’s famous Golden Bridge, its subtle enough that it doesnt interfere with dial readability. The Holllywoodland is powered by the self-winding Girard-Perregaux 03300 manufactured calibre, with a chronograph module made by Dubois-Depraz. The movement is visible through the case back where you can also see the oscillating weight which recalls the Brand’s identity codes. 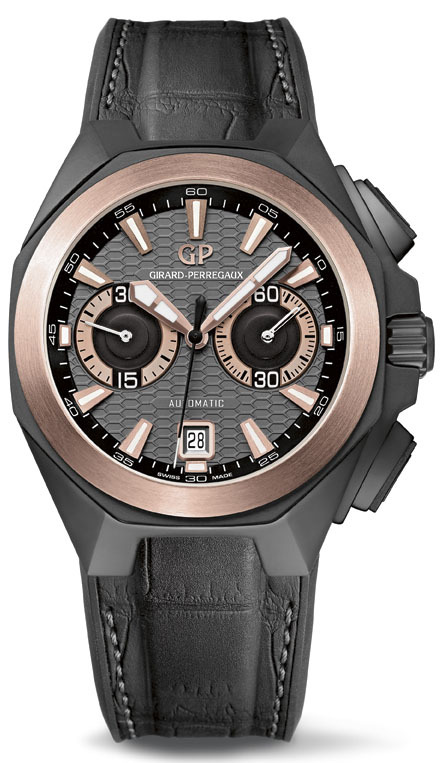 The Girard-Perregaux 03300 powers the hours, minutes, small seconds (at 3 o’clock), date (in a window at 6 o’clock) and chronograph functions. The self-winding movement has a frequency of 28,800 vph and a power reserve of 46 hours. 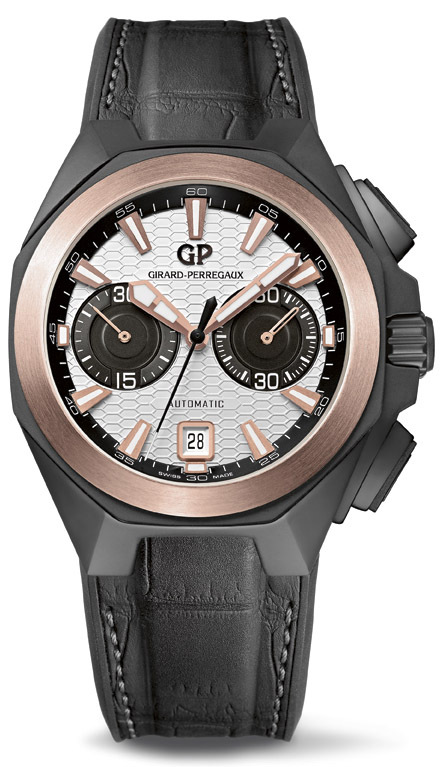 The Girard-Perregaux Chrono Hawk Hollywoodland comes in two dial colors a light silver and a dark grey, both with the same texture as the other Chrono Hawk models. 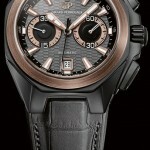 One is a light silver with black subregisters , pink gold hands and hour markers and filled with luminous material. Then there is a dark grey version which also has pink gold subregisters giving more contrast, both versions come with the same texture as the other Chrono Hawk models. 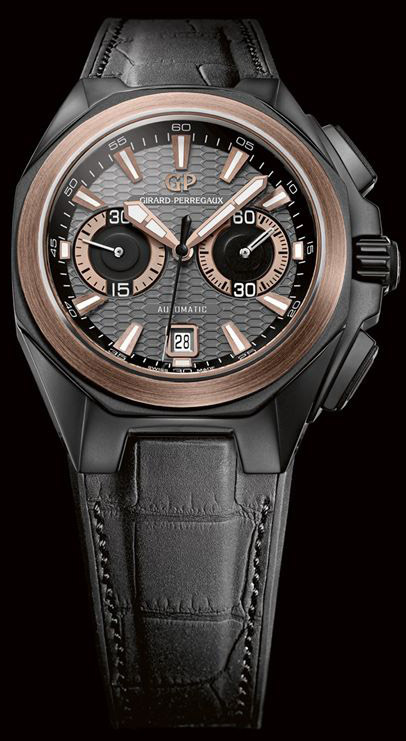 With its black ceramic case and pink gold bezel the Girard-Perregaux Chrono Hawk Hollywoodland has a sporty elegance, the ceramic makes it lighter and more comfortable while its design will appeal to someone looking for a timepiece that is traditionally handsome with moderns accents. 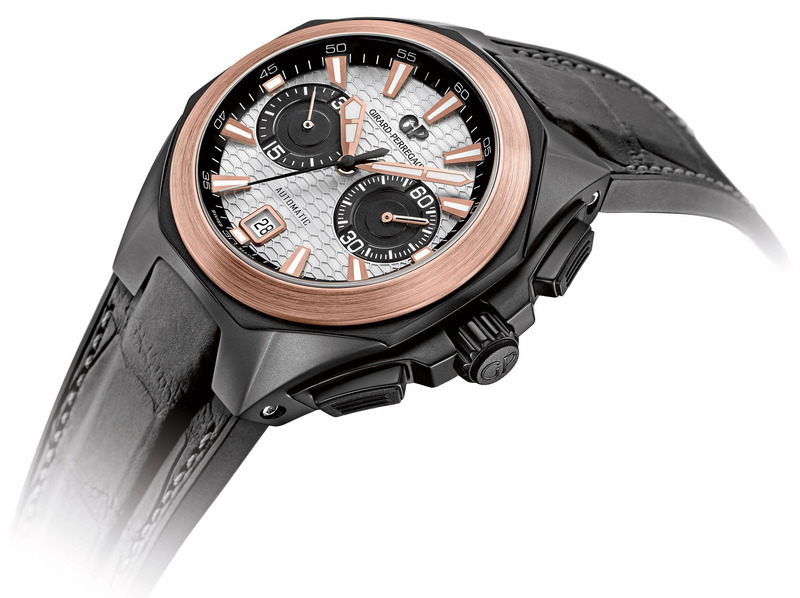 The Girard-Perregaux Chrono Hawk Hollywoodland retails for $21,400. 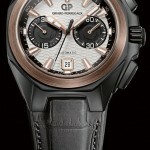 More resources about the Girard-Perregaux Chrono Hawk Hollywoodland on Monochrome, Hodinkee, and WatchTime. 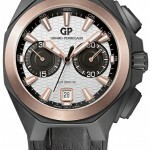 Hands-On review of the GP Chrono Hawk by Amr Sindi also available on DreamChrono Blog.